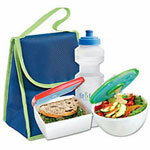 The Salad POD holds just the right portion of lettuce and easily fits into any lunchbox, bag or briefcase. The unique dressing dispenser in the lid keeps your dressing separate from the salad so your lettuce will not be soggy by lunchtime. Salad bowl holds up to 2 1/2 cups of salad. 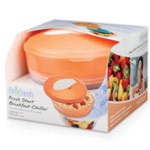 Removable ice pack snaps into the top lid, keeping salad fresh and cool. Dressing dispenser holds up to 2 tbsp. of dressing. 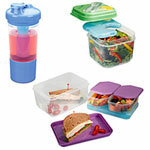 Easy to clean, freezer, microwave and atop rack dishwasher safe except for the ice pack. Do not microwave the ice pack. 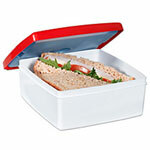 Meets FDA regulation for food grade plastic. BPA free. Measures 5 1/4 inch in diameter, 3 inch high.